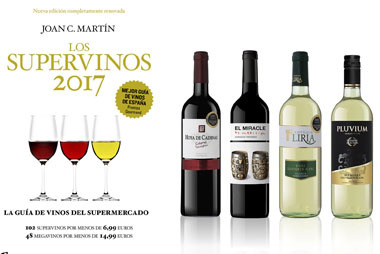 The winemaker and writer of “Los Supervinos 2017”Joan C. Martin likes to face the supermarket shelf and let himself be impressed by the wines that he can find there. He is able to taste 981 wines and make a selection of the 150 best which are in this guide, “supermarket wine guide” with 102 “Superwines” for less than € 6.99 and 48 “megawines” for less than 14,99€. According to Gourmand Awards “Los Supervinos” is considered the best wine guide of Spain. In this edition, Vicente Gandía is well positioned because four of their wines are very well rated in this guide: Hoya de Cadenas Cabernet Sauvignon, El Miracle by Mariscal, Castillo de Líria Blanco and Pluvium White. With these high scores the winery remains a benchmark offering excellent quality wines with a great value for money. Hoya de Cadenas Cabernet Sauvignon is a red varietal with appellation of origin Utiel- Requena. The grapes are grown in the “Hoya de Cadenas Estate”. It is an eco-paradise just 100km from the city of Valencia. The estate boasts over 300 hectares of the finest local and international vine varieties. This Estate enjoys a particular micro-climate with temperature variations from day to night which gives the grapes their own special characteristics. El Miracle by Mariscal is an intensive wine with an attractive colour from old vines, with appellation of origin Valencia and 100% grenache. 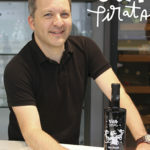 This wine is inspired by the barrel of Javier Mariscal which its part of the “Arte en barrica” museum collection in the Finca Hoya de Cadenas, owned by Bodegas Vicente Gandia. This wine it’s for cosmopolitan and avant-garde palates like Mariscal’s art. Castillo de Liria white is a young, dry wine with appellation of origin Valencia and whose grapes varietals are Viura and Sauvignon Blanc. Since 1971 Castillo de Liria is the pioneer wine brand in Valencia. Wines made from indigenous and international grape varieties, present in more than 60 countries of five continents, becoming one of the best selling Spanish wine brands in the world. Pluvium White is a white, young wine with appellation of origin Valencia, from the subzone Alto Turia and elaborated with Merseguera and Sauvignon Blanc grape varietals. It is the fruit of the wonderful combination between the ground and the rain. It’s one of the best wines from Spain in value for money.